The CPDSA manages free roller skating sessions in partnership with the City Agencies—Parks Department, the Police Department and the Central Park Conservancy—obtaining all permits necessary to organize legally sanctioned, safe and secure events. The CPDSA acts as a liaison between the skaters who enjoy attending the events and the City Agencies. During warmer months, the City also hosts large events that preempt The Skate Circle. The CPDSA communicates those dates to the Skating Community so that there is no conflict or disappointment for the Skaters. The CPDSA is a non-profit organization that provides free roller skating to live DJ music in Central Park. It takes a special touch to spin music you can skate to. That’s just what our DJs do: mixing classics and cutting edge deep and soulful house music, they get you going and keep you rolling all afternoon. Note that the CPDSA does not supply nor rent roller skates. Scroll down to read about Our Mission, Our Vision, Our Goals, Our History and how critical Your Support is. Our mission is to offer present and future generations a free, open-air roller skating experience with live DJ music at “The Skate Circle” in New York City’s Central Park, on most weekend days during the warmer months (April through October). To enhance the experience of the skaters by refining the CPDSA operating guidelines, improving its sound system and continuing to book the best DJs who understand roller skating and what music keeps skaters rolling. To work more closely with the City and Private Businesses to achieve sustainability and permanent status of City Recreational Area. This would include having The Skate Circle repaved, resurfaced and maintained to provide a smoother skating surface. Famous New York photographs from the 1890s show people ice skating on the Lake and the Boat Basin in Central Park. Roller Skating in the park was popular in the 1930s, which is depicted in a vintage poster for a roller skating event that took place on Halloween 1936 (see below). 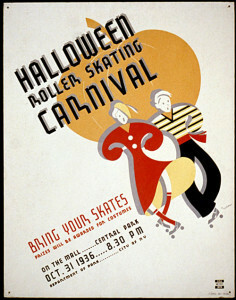 There is a mention of roller skating in the Bandshell area in the book “Catcher In The Rye,” which was published in the early 1950s. The current generation of roller skating on the Dead Road began in around 1978 when a roller skate rental business called “Good Skates” started to operate at the Mineral Springs facility just west of the Dead Road. Roller skating was very popular at that time and soon that whole area of the park was teeming with skaters. A number of skaters painted guide lines on the pavement in the form of two concentric circles. Skating became a regular part of the fabric of that area of Central Park. In 1994, when the north end of the Dead Road was repaved as part of the Bethesda Fountain and Bandshell restorations, skaters learned about a map being produced by the Parks Department that showed Volleyball courts covering the whole area. A few skaters produced a petition demanding a voice in how the area was going to be used. Six hundred skaters and concerned citizens signed this petition and a loosely organized Ad Hoc committee met with Parks Department officials in a dialogue designed to find an accommodation for the skating community. An agreement was reached and the skaters began a cooperative effort to work with the Parks Department. This agreement lasted as long as the Dinkins Administration stayed in office. In April of 1995, the newly elected Guiliani Administration reneged on the agreement and began to wage a campaign to chase the skaters out of the park. The new Administration was able to change the municipal code governing the number of people who could assemble freely without a special-event permit, reducing the number from fifty to fifteen people. The Administration was also able to push through a requirement that anyone using an amplified sound device had to have a special-event permit from the Parks Department and an amplified sound permit for that device from the police. Faced with the prospect of being thrown out of the Park, a group of skaters formed the Central Park Dance Skaters Association (CPDSA) and went to work organizing the skaters, consulting with lawyers and informing the media about this abridgment of their rights. Over the following three months, the Central Park Dance Skaters Association waged a campaign to win back their rights to skate to music in the park. When the Administration finally realized that they could not get rid of the skaters, they met with the CPDSA representatives and granted the CPDSA the right to obtain all the requisite permits needed to legally hold skating events. In the end, the attempt to rid the park of skaters had the opposite effect, forcing skaters to organize and get all the requisite permits while gaining the support of some of the officials in power. Since then, the CPDSA has continued to do whatever is necessary to keep The Skate Circle rolling on warm weekend days. Memberships and donations help us pay for permits, sound equipment, and other essential operating costs necessary to keep the CPDSA Skate Circle rolling. Without your support there is no Skate Circle. If you wish to become a volunteer, click HERE to contact us.